As a kid, I HATED roast! Mom would frequently make it on Monday nights, and I would just despise it. Eventually I got smart and would kill the taste by rolling the meat in a flour tortilla with some salsa. 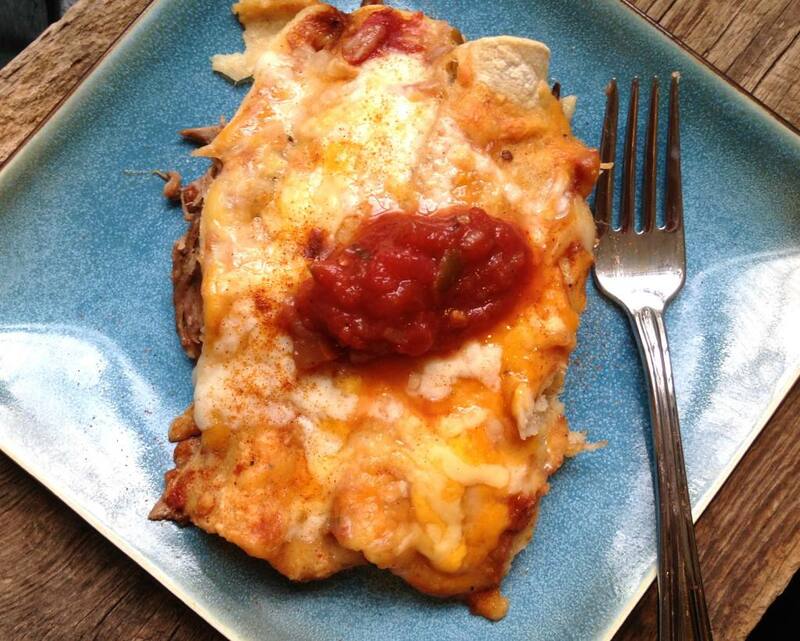 I guess that’s why these beef enchiladas are my new favorite! They remind me of how at an earlier age, I put a Mexican twist on roast. Recently I started using a slow cooker. It makes life soooo much easier when you can literally dump all your ingredients in the crock pot, and have a delicious dinner 6-8 hours later. Since I’m obsessed with the slow cooker, I’ve been looking for recipes, and found this one via Mel’s Kitchen Cafe. 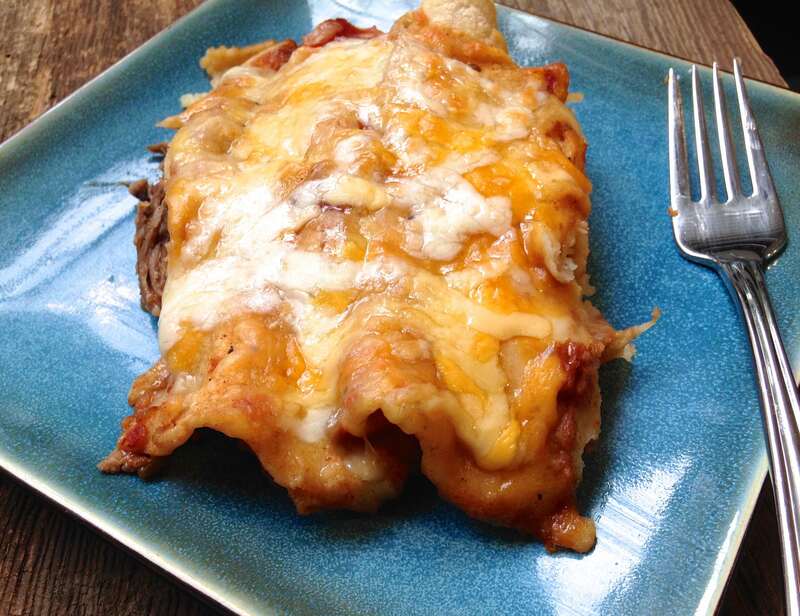 The slow cooker does all the work and makes the beef roast tender and juicy. To my enjoyment, there is a cup of salsa, and a bunch of spices like cumin, chili powder, onion powder, and garlic powder added to the roast to make one delicious sauce. I see roast in a whole new light now. Enjoy! 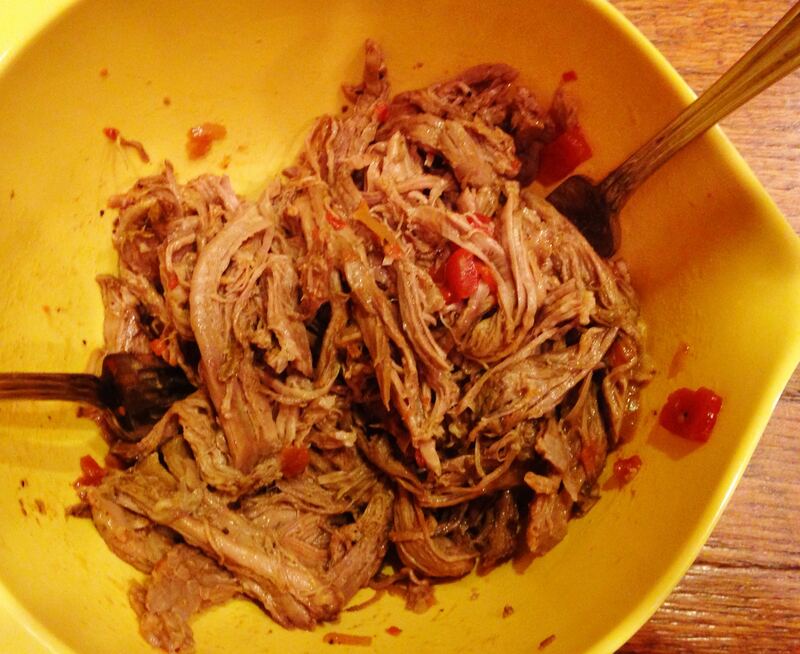 In a 4- or 5-quart slow cooker, add beef roast. Whisk together the broth, vinegar, salsa, cumin, chili powder, onion powder, garlic powder, salt and pepper. Pour over the roast, cover the slow cooker, and cook on low for 8-10 hours until the beef is tender and shreds easily. Remove the roast from the slow cooker and place in a large bowl. Pour the mixture from the slow cooker into a saucepan and bring to a simmer. In a small bowl, whisk together the flour with about 3 tablespoons of water. Whisk the slurry into the simmering liquid and cook, stirring constantly, until the mixture is thickened slightly, 4-5 minutes. Pour about ½ cup sauce in with the beef and toss. Spread another ½ cup sauce on the bottom of a 9x13-inch pan. Toss the cheese together. 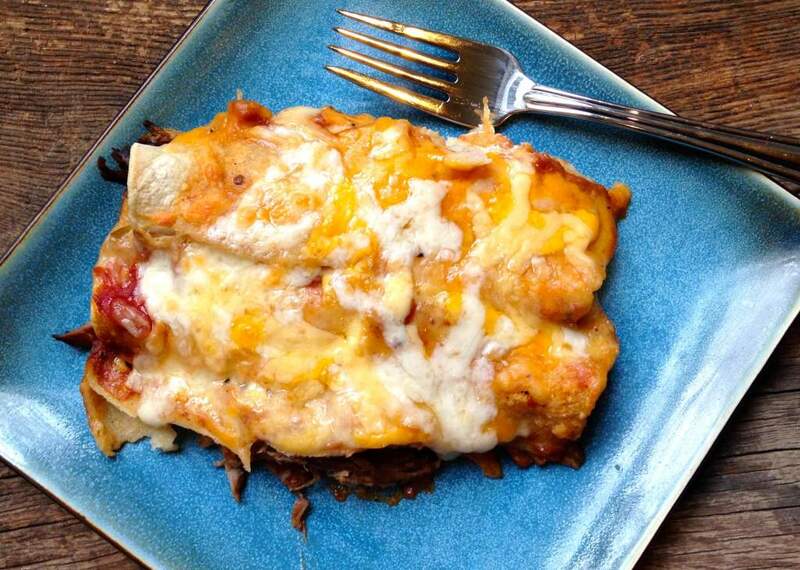 Fill each tortilla with some of the beef mixture and a sprinkle of cheese. Roll up and place in the pan. 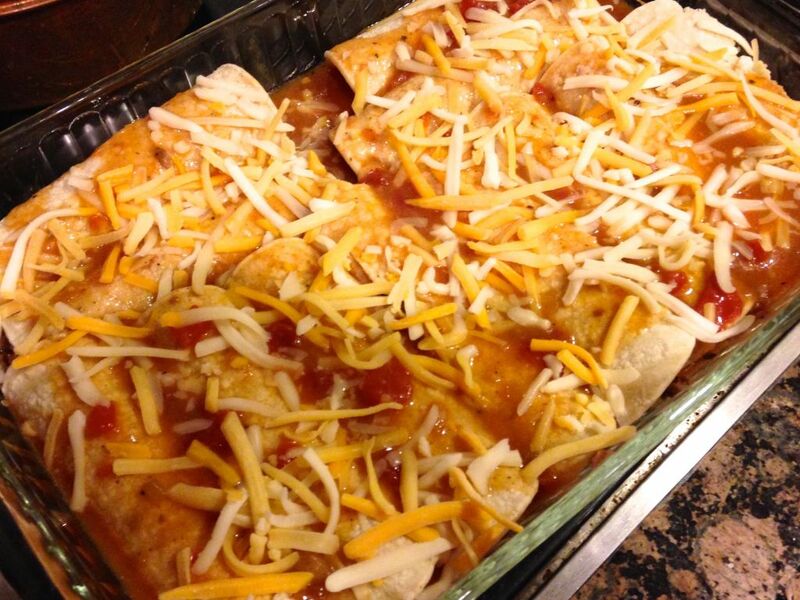 Pour the remaining sauce over the enchiladas. Top with remaining cheese and bake at 350 degrees F for 25-30 minutes. 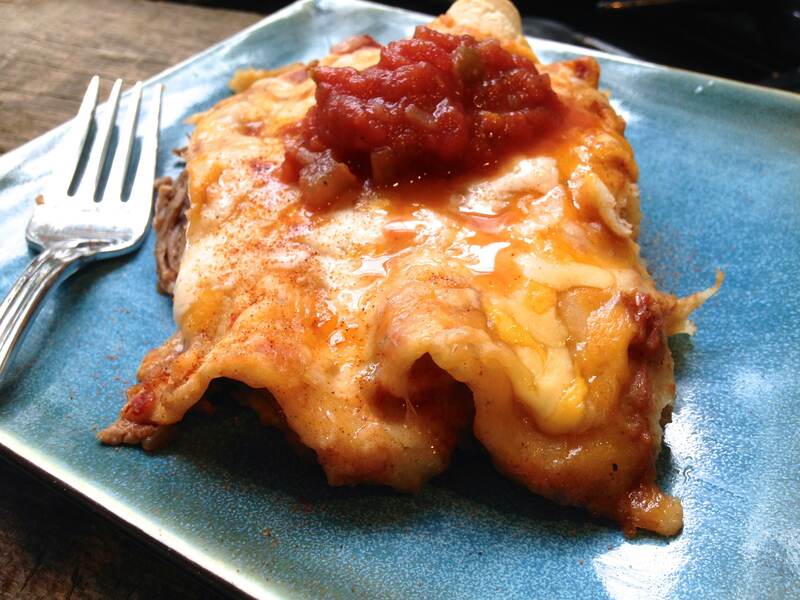 Let enchiladas rest for 5-10 minutes before serving. Sprinkle with fresh cilantro, salsa, or sour cream if desired.